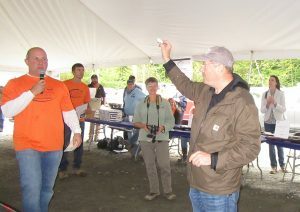 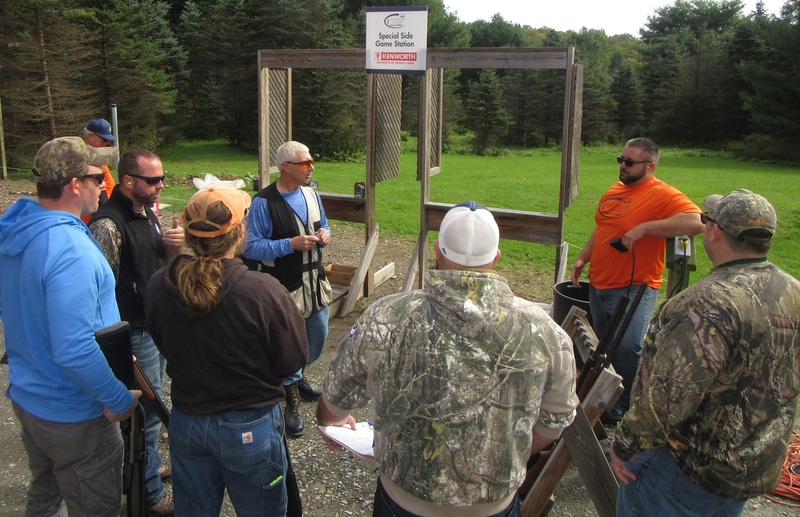 Mark Volk (in vest at top, center) gives new arrivals to the annual Lackawanna College School of Petroleum & Natural Gas Sporting Clay Tournament an upfront chance to win raffle tickets and get the lay of the land at Haussman’s Hidden Hollow sporting club on Sept. 27. 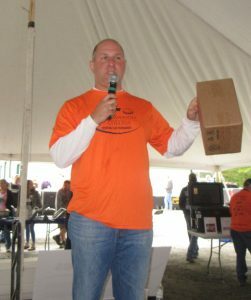 Volk is president of the school, which took on the coordinating role of the event this year. 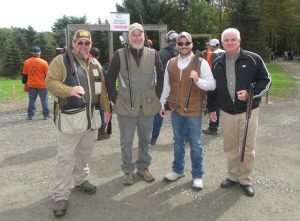 Teams arrived from the surrounding area, including the Greenley’s BBQ team from Wyoming County, which included (above, from left) Jim Greenley, Steve Skovronsky, Ethan Greenley, and David Plummer. 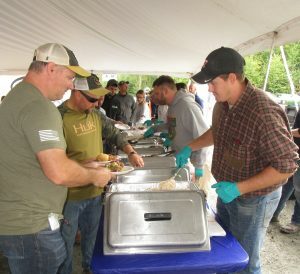 Greenley’s BBQ also provided half of an expansive buffet meal provided for contestant. 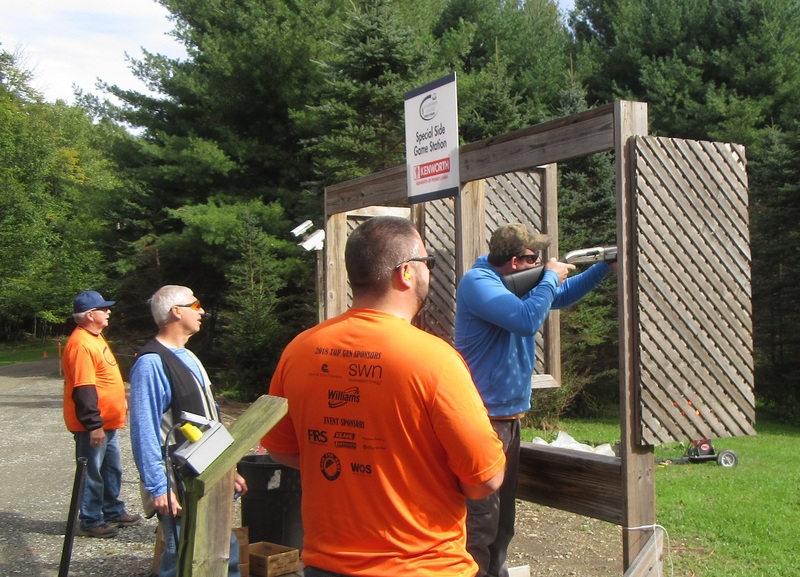 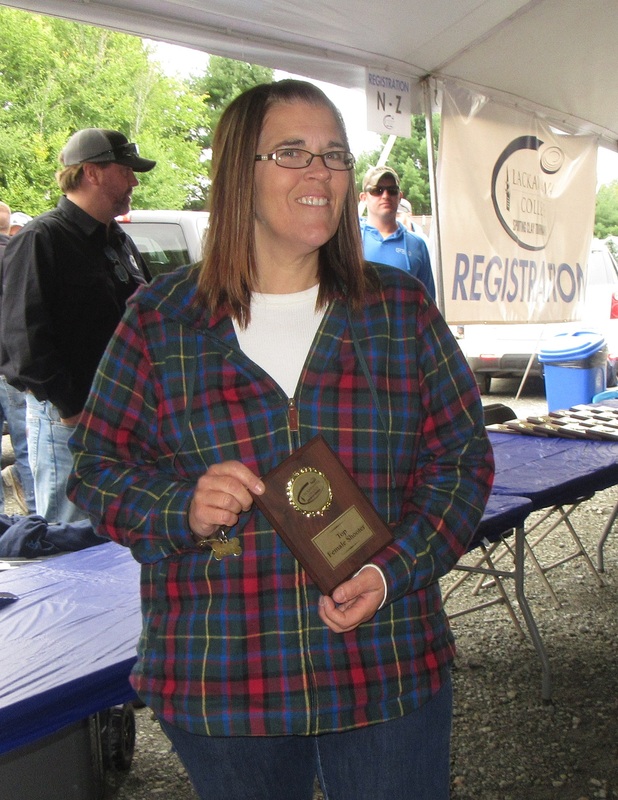 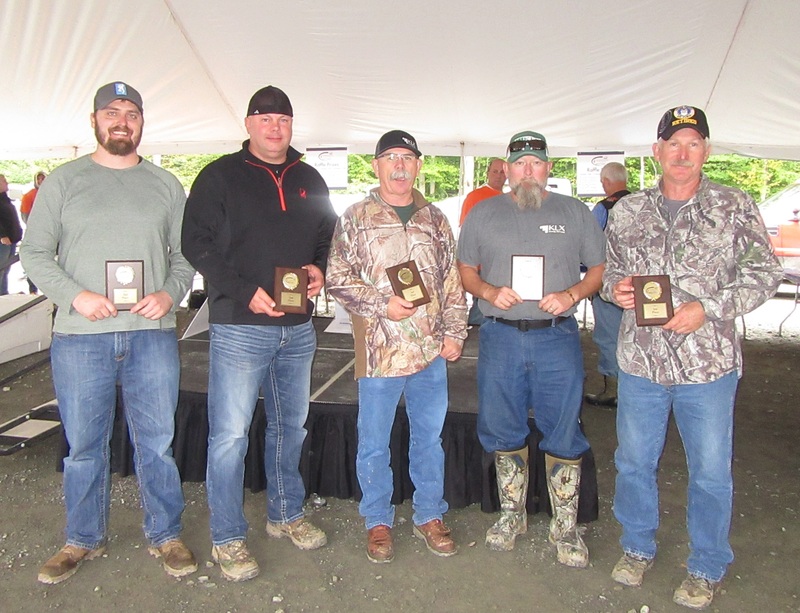 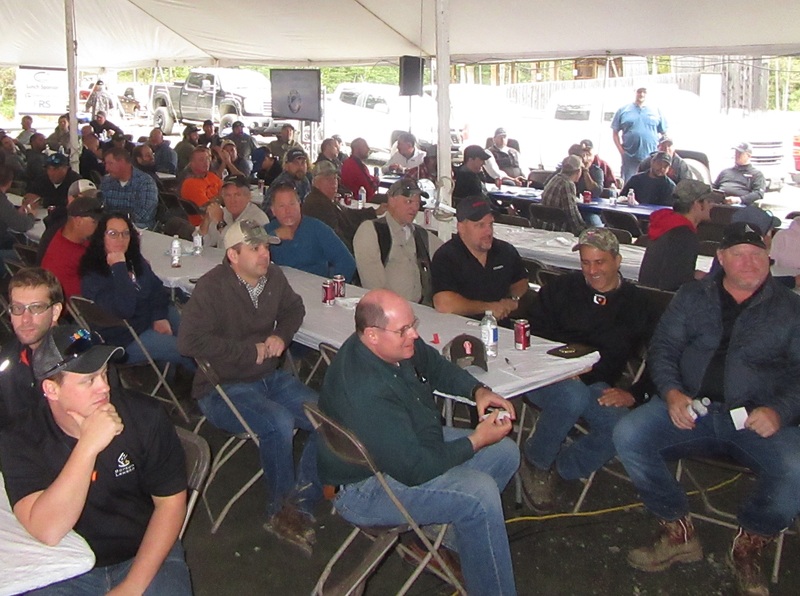 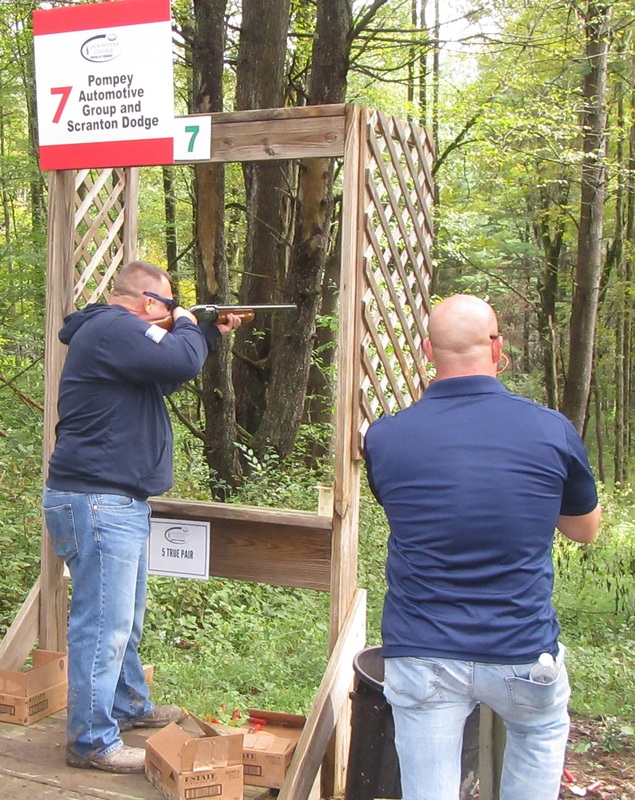 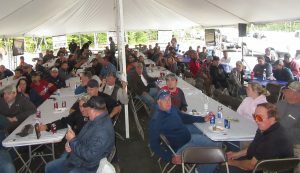 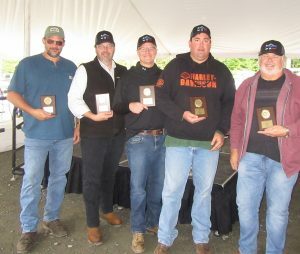 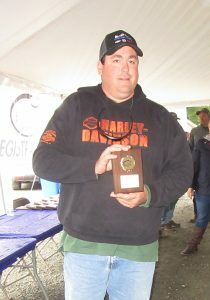 After five years of growth under Cabot Oil & Gas, the annual Sporting Clay Tournament benefiting the Lackawanna College School of Petroleum & Natural Gas was enjoyed once again by hundreds of sportsmen and women and corporate sponsors on Sept. 27. The new twist this year is that the friendly competition was managed by the college, its staff, and its students. Not only does the event provide funding for equipment, scholarships, and programs, it affords students and potential employers an opportunity to meet face-to-face under recreational circumstances. 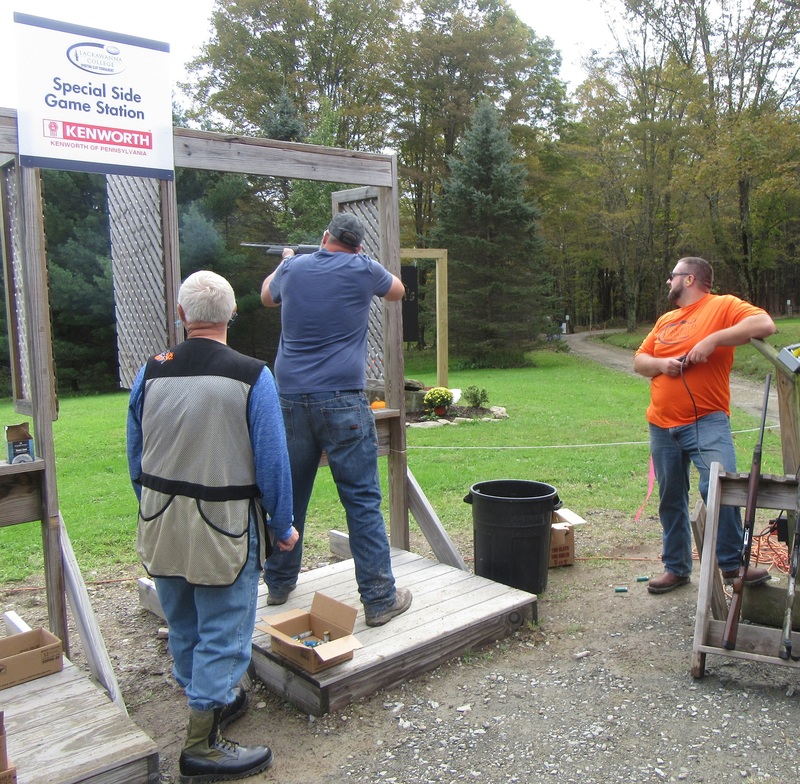 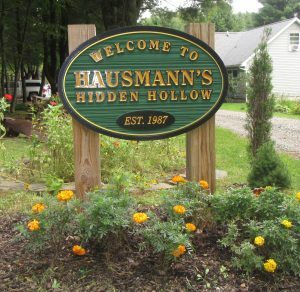 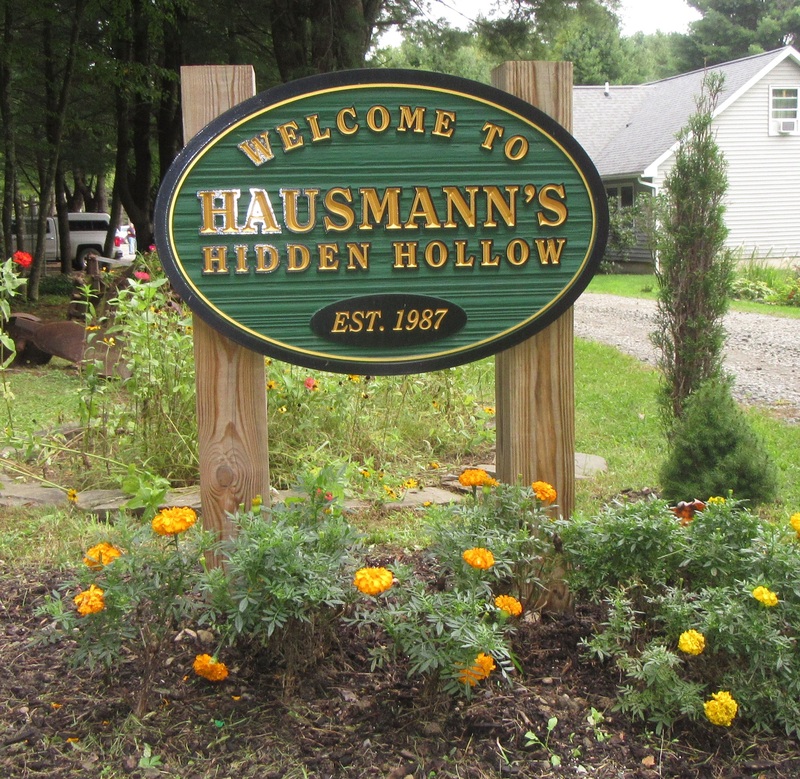 The event at Haussman’s Hidden Hollow sporting club near Friendsville in Susquehanna County drew competitors from a wide area vying for trophies, bragging rights, a catered lunch, chances to win donated prizes and an opportunity to support a school that is providing more of them each year with qualified employees. 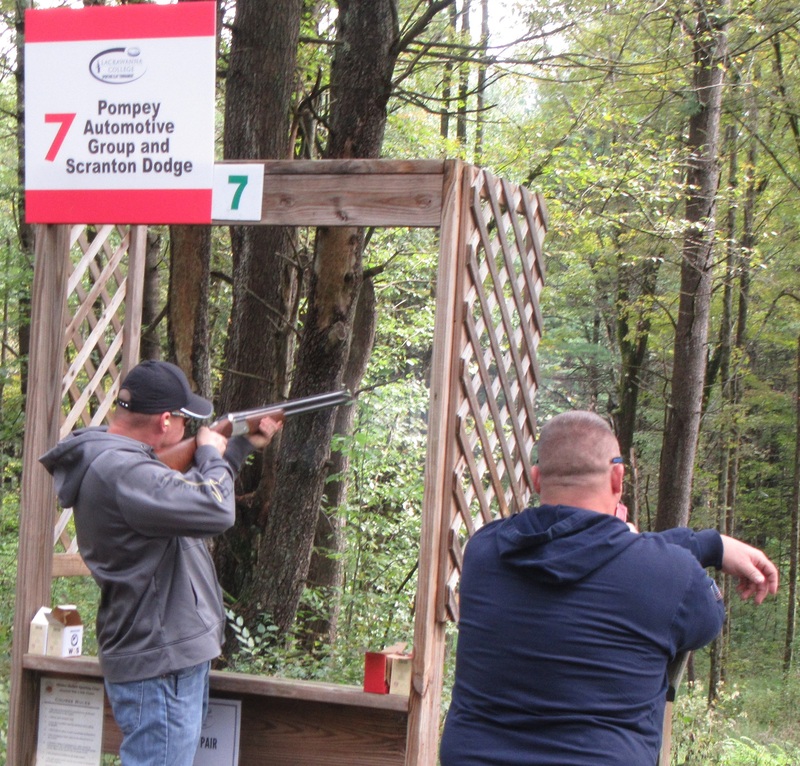 In previous years, as many as 400 shooters utilizing four separate ranges featuring 10 stations each took part in the clay shoot. Once Cabot had fulfilled its endowment agreement to Lackawanna College, the natural gas company handed the reins of the popular fundraiser over to the school, suggesting that it be downsized for the first few years until the new organizers were familiar with the process. 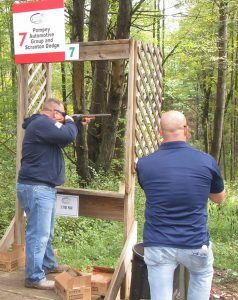 Cabot, Southwestern Energy, and Williams continue to be the primary benefactors of the event, but many other companies, like Kenworth of PA, sponsored elements of the competition, such as the individual shooting stations. 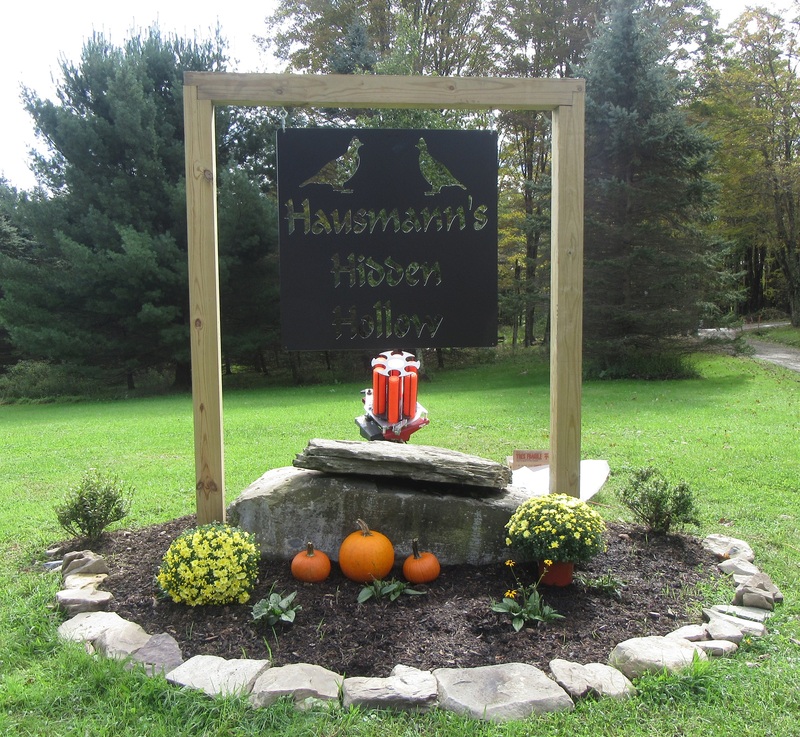 “The college can always rebuild it,” Volk noted of the growth potential. Judging by the smooth transition of teams from one station to another, the shuttling by students of participants from the off-site parking lot to the competition area, the smiles on the faces of contestants, and the well-orchestrated awards ceremony that followed lunch, one can only guess that the tournament will be expanding again by next year. 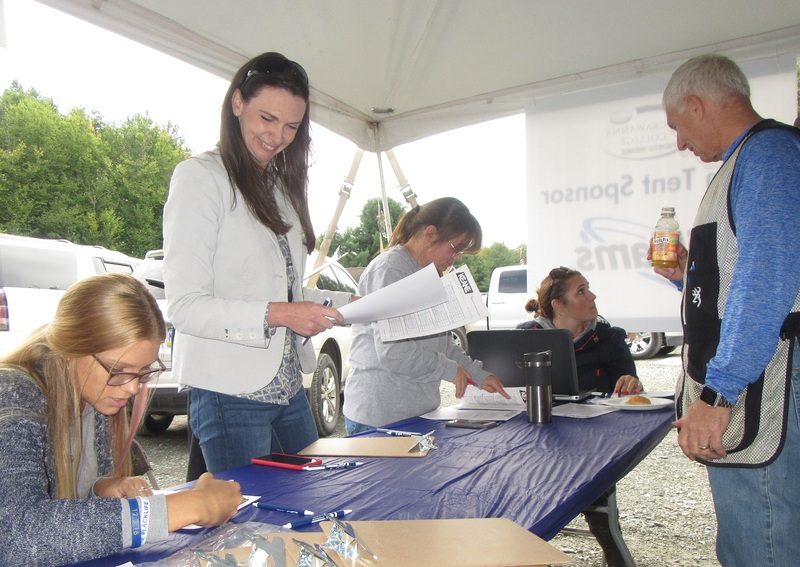 “One of the best indicators of the success of the school and the event is the number of our graduates who are back here shooting as representatives of their companies,” School of Natural Gas program director Jeannine McKnight offered. The success of the investment by those companies, she added, is realized by the pool of students who they now hired directly or taken on as interns. 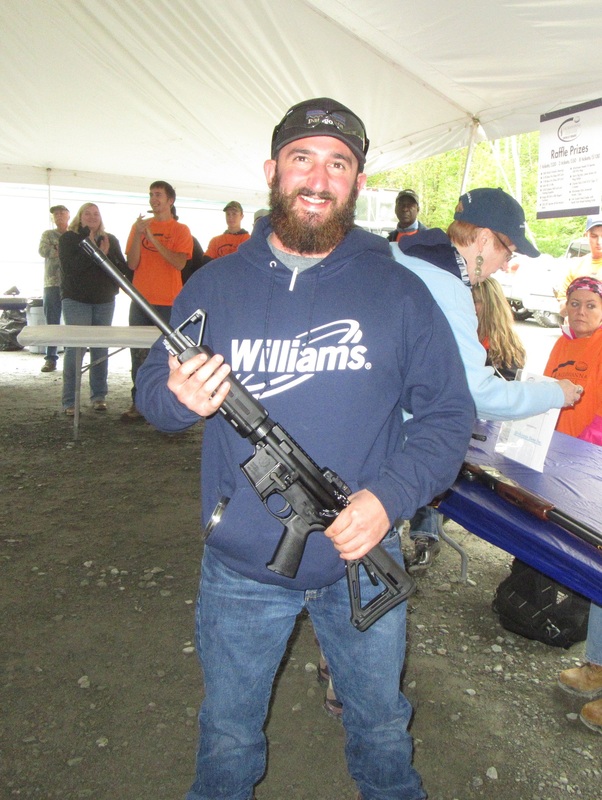 Ryan Stalker, liaison project manager at Williams, noted that he worked for Lackawanna College prior to the development of the natural gas program. 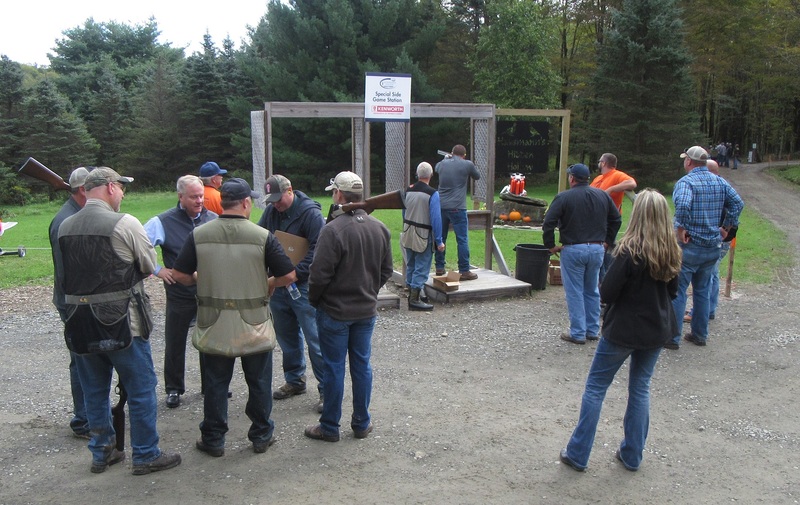 The relationship between school and industry works both ways, he explains. “They are producing a competent work force, and Williams has been able to influence the program,” Stalker (above) stated. “We continue to build on that partnership.” Williams has hired approximately 30 students from the school. Julie Lewis, shooting that day for one of the Leatherstocking teams, is a graduate of the natural gas program whose double major in measurement and business has already resulted in a solid job with the company and potential for rapid advancement. “If you told me four years ago when I started at the school that I’d be in this position, I’d say you were crazy,” Lewis remarked. Formerly a student teacher, Lewis as also been invited back by the school to teach ethics leadership and regulations. 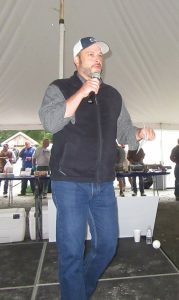 Lewis in turn inspired Jason Goss, whom she met as an entry-level employee of Leatherstocking. 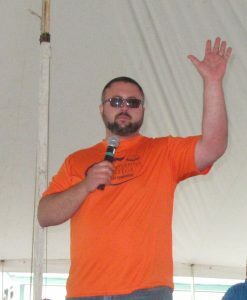 Lewis encouraged him to enroll at the school, which he feels has already furthered his career with the company. 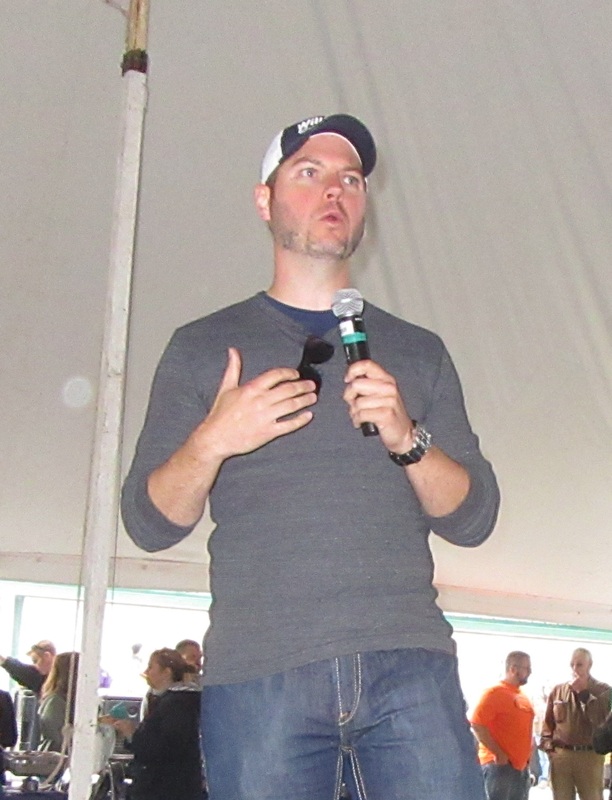 “It has opened up doors with them,” said Goss (above, right). 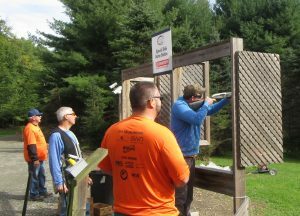 For current students like Thomas Gudykunst of New Milford, who arrived early to set up the courses, drove shuttles, then broke down and cleaned up after enjoying some shooting time on the range, volunteering at the event meant meeting and talking with the people with whom he might eventually be working. 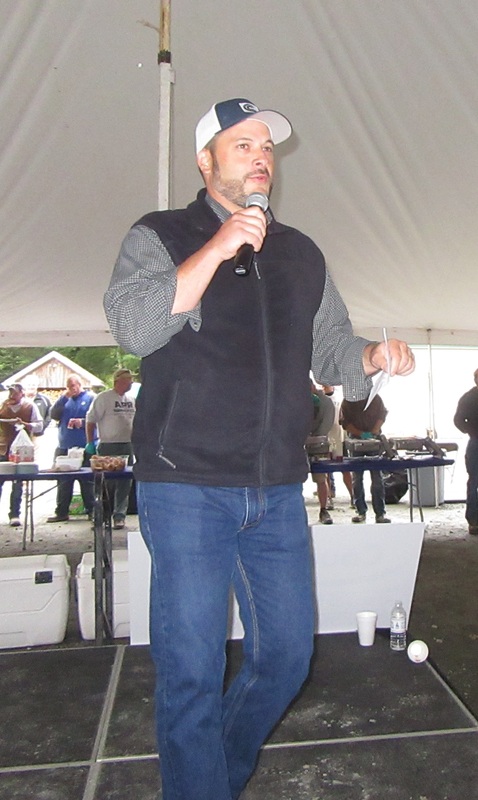 He has yet to secure an internship and was hoping to discover some leads. “It’s a great opportunity if they choose to take advantage of it,” Cabot coordinator of external affairs Bill desRosiers (above) said of the students interfacing with clay shoot participants, most of them employees, executives and customers of gas industry partners. 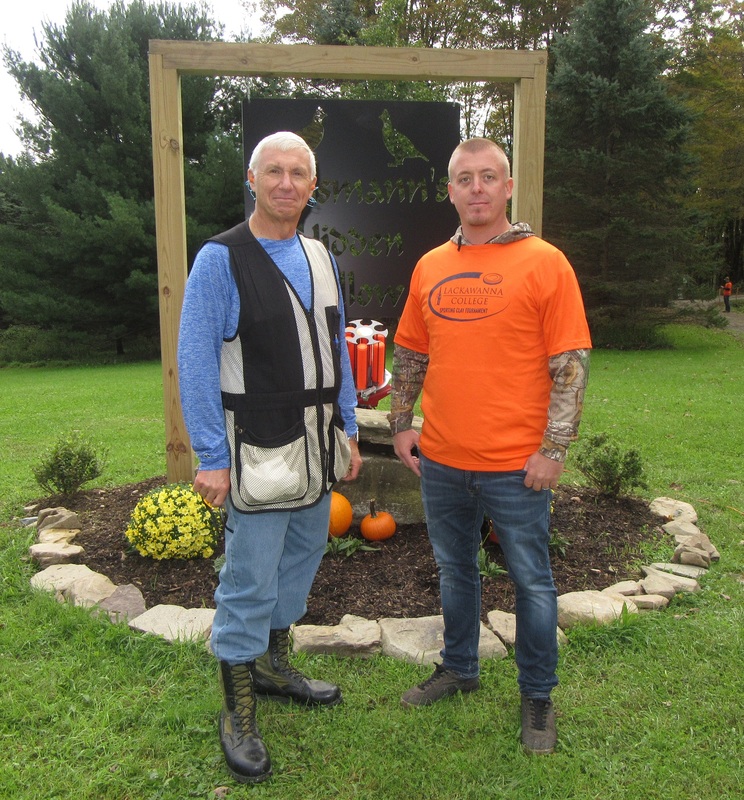 “We were thrilled with the support and participation that we had again for this year’s event,” Brian Costanzo (above), vice president for college advancement remarked. “Our hope is to continue hosting the event for the foreseeable future.” Approximately $91,000 was raised through the clay shoot tournament, and participants are already looking forward to next year’s tournament, which will be held on Thursday, Sept. 26, 2019. The Sherwood Trucks team, made up of Brandon Groves, Roy King, Art Carpenter, Butch Gorko, and Jack Remington took top honors on Course #1 this year. 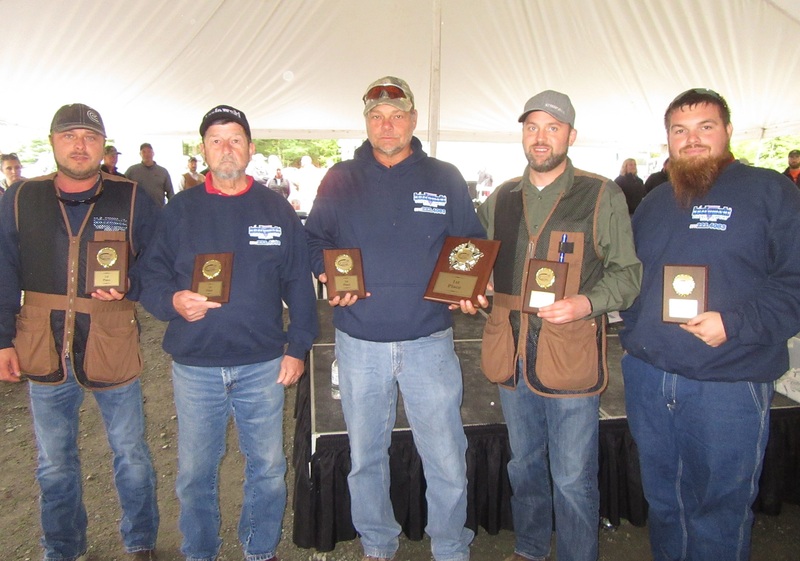 Course #2 winners were Charles Egli, Ralph Larson, Dwight Basa, Eric Bronson, and Dave DiGennaro representing Keystone Clearwater. Kozlowski Trucking took second place on Course #1. 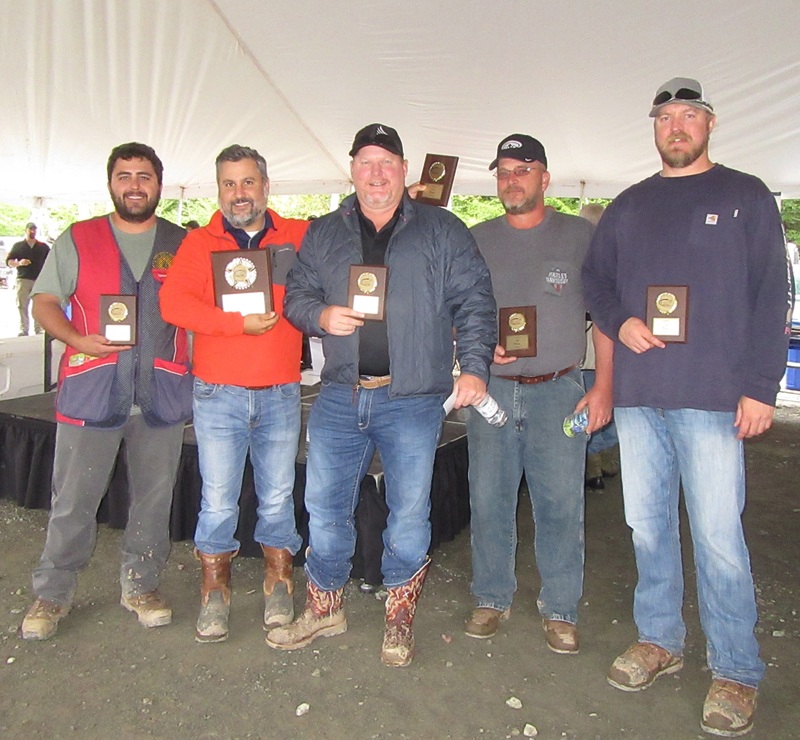 KXL Energy Services took second place on Course #2. Though he did not shoot on Sept. 27, clay shooting is a family tradition for Rep. Jonathan Fritz, who attended in support of the school. 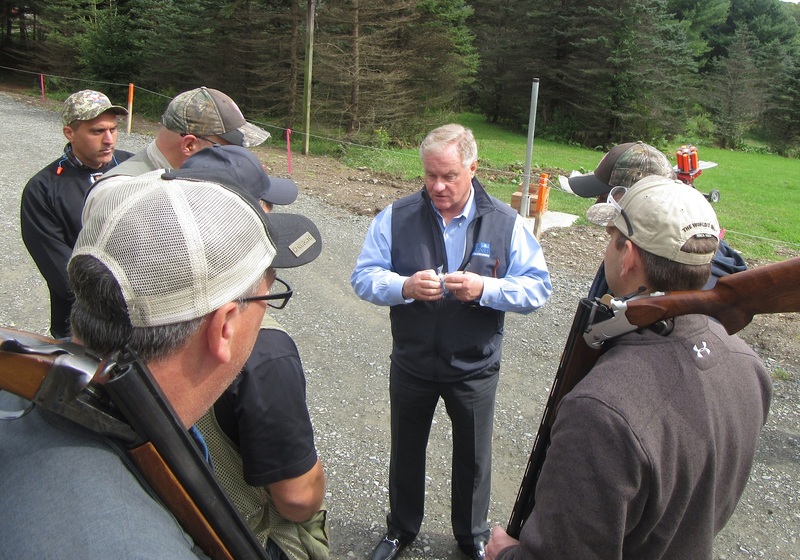 Proudly pro-gun and pro-gas, Pennsylvania gubernatorial candidate Scott Wagner was a welcome visitor to the annual tournament.